Do you have the skills to provide basic CPR and First Aid for a friend or family member in an emergency? Learn how to respond to emergencies with this community based CPR/AED and Basic First Aid training course. Receive a two year certification after successful completion of the course. NOTE: Course does not meet healthcare level CPR and First Aid Training requirements. Splashball provides basics water skills along with an understanding of the sport of water polo in a recreational format. The program is unique in aquatic sports as it provides a team element that supports social development. Splashball harnesses all the fun, dynamic aspects of the game in a safe, easy to learn experience that will motivate participants to swim, make new friends, and stay fit. 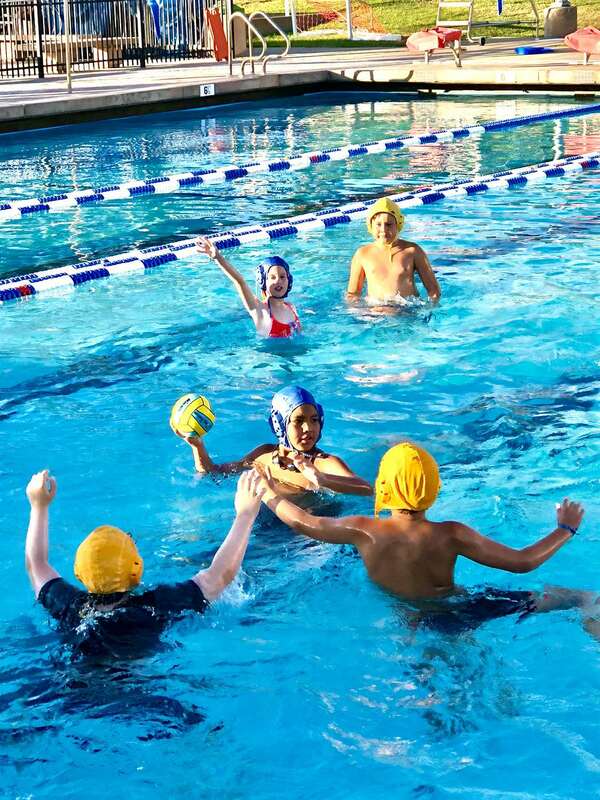 No prior water polo experience required, participants will play as they learn. Participants must be able to swim 15 yards and tread water. Dive deep with personalized diving lessons with California Diving Academy. Designed for total beginners all the way to the most advanced divers, each participant safely advances at their own pace through individually tailored skills designed for advancement. Participants must pay a one-time membership fee to AAU prior to the first class at http://play.aausports.org and register as a new athlete. Prerequisite: Must be able to swim in the deep end of the pool. This fun and engaging camp is designed to introduce and prepare participants for the job of lifeguarding. Participants will train and prepare similar to actual Lifeguards while being introduced to leadership skills, good decision making, work ethic, and professionalism, and team work. Develop characteristics such as leadership, responsibility, and teamwork. Each day participants will spend time in the pool, on the field, and in the classroom working on physical fitness games, activities, water rescues, CPR/First Aid skills. Camp fee includes a Junior Lifeguard - Basics rash guard. Prerequisite: Participants must be able to swim at least 25 yards. This course will put the skills from the Basics program to work. Participants will continue to train and prepare for the job of lifeguarding by working on advanced skills in the pool, on the field and in the classroom - all while having fun! Upon completion of this four week camp, participants should have the knowledge and ability to become a lifeguard. Camp fee includes a Junior Guard - Advanced rash guard for sun protection. Prerequisite: Must have completed Junior Lifeguard - Basics. When you get right down to it, water is just plain cool! Our camp has been designed for you, the young diver! This exciting new program is built around the action packed PADI Seal Team. Each day campers will complete an AquaMission, which will take you on an underwater pool adventure where you will learn and complete activities while using the provided scuba equipment. The first day you will be developing your snorkeling skills and the rest of the week, you will be diving to the depths of the pool while expanding your diving skills and knowledge. Campers must be comfortable swimming in the deep end. $100 supply fee payable to the instructor on the first day of camp. Couldn't get enough of the Seal Team SCUBA Camp and want more? The Master Seal Team SCUBA Camp continues the fun underwater! Learn advanced skills as you dive to the depths of the pool completing challenging AquaMissions. All scuba diving equipment is provided. $100 supply fee payable to the instructor on the first day of camp. Prerequisite: Must have completed Seal Team SCUBA Camp. Love the pool and love camp? Get the best of both worlds when you jump in and make splash in the Star Guard Aquatic Camp! With activities in the pool, on the field and in the classroom, there is no shortage of fun. Campers will participate in swim lessons, a variety of games, crafts, sports and learn important personal water safety lessons. Each week has a theme that activities will relate to and will vary each session. Register for your favorite week or for all five! Campers must bring a lunch with them (no lunch provided). Camp Fee includes includes a Star Guard rash guard for sun protection. Prerequisite: Campers must be comfortable in the water. It’s summer time, so let’s get outside and bring your favorite games to life! Create your own Fortnite character, build a Minecraft fortress and even invent a game of your own. Enjoy summer and leave the phones and tablets behind. Campers will cultivate a love of science as they participate in one crazy experiment after another. Campers will get up close and personal with experiments as they explore cool chemical reactions and even make their own tie-dye shirt! Get ready to get messy and have fun! Calling all Incredibles! Join us for a week of SUPER fun as we learn about Mr. Incredible, Elastigirl, Violet, Dash, and Jack-Jack. Campers will explore the scientific principles behind hero powers, make their own Incredible masks, discover their hidden powers and take on secret missions of their own. Campers will be amazed as they create instant hot ice, test the limits of elasticity through homemade slime and give items the ability to fly. Explore what the great outdoors has to offer by learning about nature, outdoor safety, first aid and of course survival skills. Build a shelter, navigate with a compass, use nature to create art and even build a working boat from scratch. What are you waiting for, let’s go on an adventure! This camp will transport campers into a mythical world of witchcraft and wizardry through activities in arts, magic, storytelling and more. Campers will have the chance to create a wardrobe fit for a wizard, make a witch’s hat, design a spell book, create potions and practice your magic skills. Learn to dance in water with the world-renowned Walnut Creek Aquanuts! These amazing camps showcase the beauty, grace and athleticism of synchronized swimming, while learning basic synchronized swimming skills. Campers will participate in a synchronized swimming performance at the end of the week to show off their talents and hard work. Participants must be comfortable in deep water and able to swim 25 yards. Its time to get those rackets ready and the swim suit out of storage. The City of San Ramon is partnering with Bonasera Tennis to offer non-stop fun to children this spring break. In the morning, campers will learn and improve their tennis skills at Bonasera Tennis Camp. After a supervised lunch from 12pm-1pm (please bring your own lunch - no lunch provided), campers will spend the afternoon at the San Ramon Olympic Pool with City Aquatics Staff, swimming and playing games in and out of the water.